Sulfur is a combination of several nutrients that is essential to an animal's healthy diet, particularly in ruminants such as sheep and cattle. Essential for growth and production of wool and milk, sulfur can be found in many animal feed sources, including water. Sulfur supplements may keep animals healthy when no natural source can be found. Sulfur is necessary for the production of amino acids in ruminant animals. Called cysteine, cystine and methionine, these amino acids are manufactured by the microorganisms in the animal's forestomach, called the rumen, along with the B-vitamins thiamin and biotin, according to Stephan Breytenbach for the website Engormix. When sulfur is deficient in the animal's normal diet, supplementing his feed with sulfur can encourage the growth of the rumen's microorganisms and improve amino acid balance. Sheep and goats typically require more dietary sulfur than cattle due to the large amounts of sulfur they require to grow hair and wool. 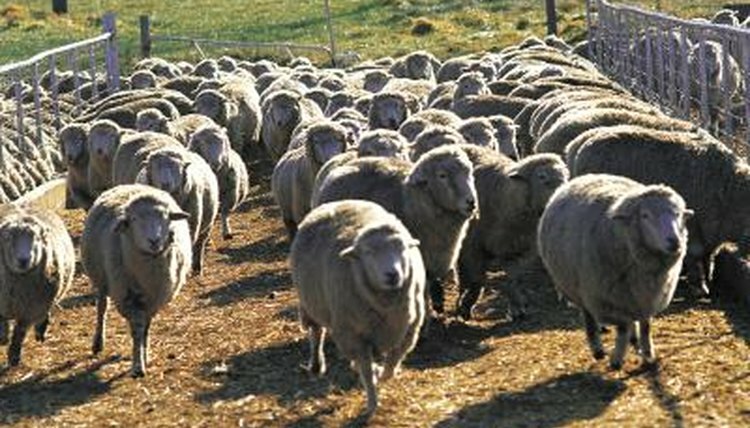 Sulfur needs may increase during a wool-growing season. Increased sulfur intake is associated with higher lamb survival rates, up to 33 percent more wool production, weight gain and stronger wool, according to Breytenbach. In dairy cattle, adequate amounts of sulfur improve the production of milk solids, milk fat, milk protein and milk casein, which leads to improved cheese production. Sulfur can be an effective flea repellent for house pets, according to the Nutri-Tech website. Elemental sulfur added to a pet's food can keep these annoying pests away. For finicky furred friends, an egg may be a tempting healthy treat that renders the same effect. The addition of sulfur to a pet's diet can improve his appearance by aiding in the production of collagen for a healthy hair coat. Sulfur's detoxifying properties help neutralize harmful nitrates in an animal's body. Under most circumstances, an animal's normal diet will not result in sulfur toxicity. Alfalfa, corn and silage contain very low levels of sulfur, and environmental sulfur itself is almost completely benign. However, a chemical that is manufactured in a bovine's rumen can be as toxic as cyanide. The chemical, called hydrogen sulfide, causes cerebral necrosis, according to Dr. John J. Wagner for Kent Feeds. This causes the cattle to go blind and exhibit poor coordination, lethargy and seizures. To prevent sulfur toxicity, care should be taken to evaluate the levels of sulfur in the animal's feed and water supply.